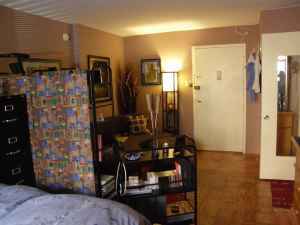 “Beautiful partly furnished studio apartment available January 1st. Hardwood floors, separate kitchen and changing area/bathroom. Located in the very trendy Logan/Thomas Circle area. 2 blocks from Whole Foods, 10 minute walk to Dupont Circle, 15 minute walk to U-St. and a 10 minute walk to McPherson Square metro. Bus stop on the corner that goes up 14th Street. Building has an awesome rooftop with a pool and great view of DC. $1400 sound right for this studio?